Last year I wrote about our deer problem along with the moles, voles, slugs, chipmunk, rabbits and the natural deer repellent we were using. Unfortunately, our hostas were pretty well eaten up before I had a chance to use the deer repellent and verify its effects. This year, when we got back home in the spring, we noticed that the deer had already started on the young hosta shoots that were poking their nose up in the garden beds. Well, at first I got very angry! I wasn’t about to lose all of our hosta leaves again this year. I marched over to the shed and got out the garden sprayer. I went into the house and got a carton of eggs out of the refrigerator, cracked them in a bowl and mixed up the eggs with water — straining the solution through a sieve so that the sprayer wouldn’t clog. I sprayed everything I could. 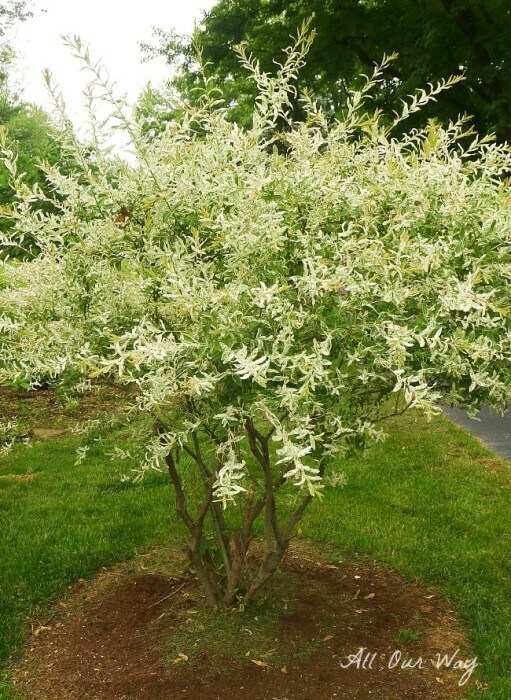 I didn’t care if the experts said that the plant was resistant to deer or not. I’d seen deer forage on anything and everything. The result for our effort? 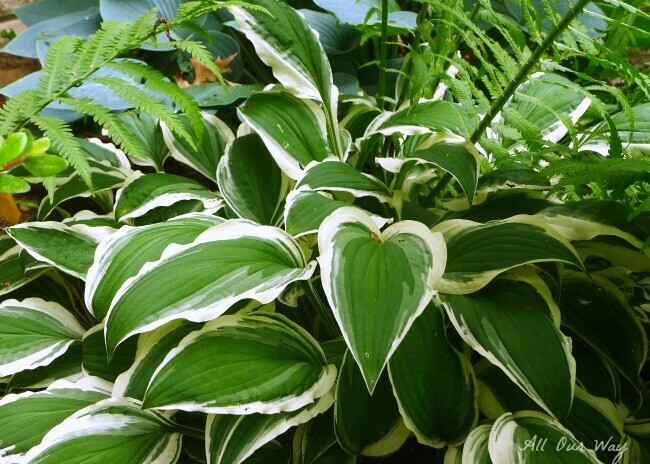 ?The hostas are beautiful– lush and full! Our other plants look great too. The plants haven’t been touched even though I’ve seen hoof prints here and there. We’ve had torrential rains and I thought that perhaps the rain would wash off the solution — but it stayed. I have sprayed periodically, especially after a week of constant rain. I did make sure it was a dry day so that the solution would have a chance to dry on the plant. In fact, we have an abundance of rabbits in our neighborhood, and yet, they’ve left our plants alone, although they seem to be enjoying the greenery on the south and east of us. I can’t be sure of this but oddly enough we don’t have any slug damage on our hosta leaves like we’ve had in previous years. We also haven’t had any vole problems, but that could be because we didn’t put down any mulch this year. As far as the mole and chipmunk situation? My Honey seems to be ahead of the game on that. This is the mole trap we use. If you’d like to know how we control the other varmints — just ask and we’ll tell you. Beat the eggs with a whisk or electric mixer. Add some of the measured water and mix thoroughly. Pour the mixture through a fine strainer to remove any thick albumen (egg white) from the mixture. This will prevent the garden sprayer from clogging. We spray every few weeks and it seems to last. 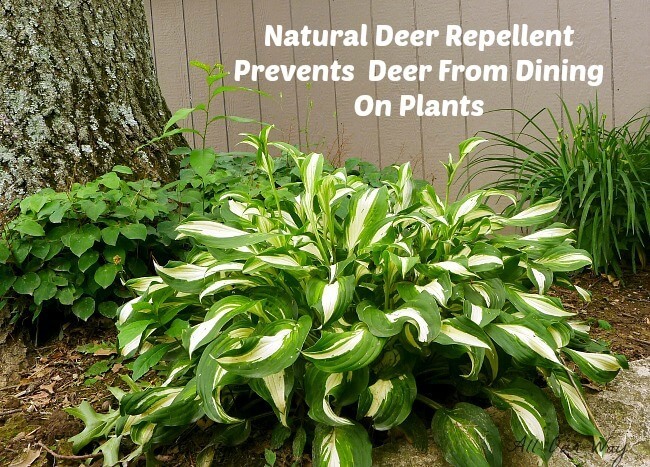 If you get a lot of rain it wouldn’t hurt to spray, just make sure it’s a dry day so that the deer repellent will stick and dry to the plants. 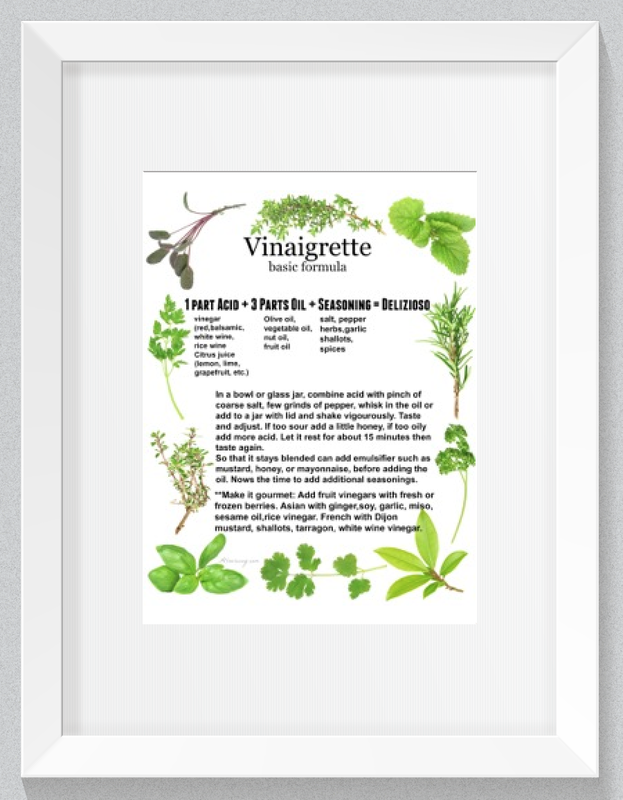 Note: Recipes and content from ©All Our Way are copyright protected. Please do not use content without prior written permission. If you want to share the information, please link to this post. Grazie. The deer have devoured our hosta again this year. But they declared war when they came right up to the house and ate my gorgeous hisbiscus and knockout roses! It’s now man (or woman) against beast! I am getting ready to spray this egg solution and hopefully sit back and laugh. We have a herd of deer that eat anything and everything. The yew bushes out front, the boston ivy on the ground and on the trees, all of my rose plants and any annuals I (stupidly) try to plant. Have tried DeerOff but it stinks and is expensive. Will try your egg solution after it rains. Worth a try. Think I will still put up the four foot plastic fencing around the rose garden since I already bought it! Do you have any magic potion to kill the deer ticks? Hi, Barbara! Wish I did have a magic potion for the ticks. Unfortunately, I don’t. The solution does have a slight odor. Not bad just kind of eggy. If you have any questions don’t hesitate to ask. I’m waiting to put it on too. It’s raining again today. Good grief, we can’t get 3 decent days straight in. Hi, thank you for your info. But a quick question. I have deer eating my raspberries plants. Is it okay to spray the egg stuff on the leaves of raspberry plants even during harvest time? With such soft fruit, I am worried that while spraying the leaves some of the egg mixture will get on the berries and make us sick eating them, even if we was them. I made a batch of the egg repellent a few weeks ago, letting it sit in my sprayer which is in the house. Man, does it stink bad when I spray it. Hi, Tony. Goodness, it smells a bit when it’s fresh in the sprayer, I can imagine what it smells like when it has sat in the sprayer — rotten eggs?? I wouldn’t use the mixture you have in the sprayer. I would use fresh. I never keep it over. I make up only what I’ll use. If there is a little left I dump it and rinse out my sprayer and nozzle. The fresh egg mixture I would say is safe to use on vegetables and fruit as long as you rinse it off really well before eating. But raspberries are delicate and have little grooves, you can’t very well scrub it off. How about picking the fresh berries and then spraying? Let me know how this turns out. We’ve got to spray our tomato plants — with all the deer have to eat why do they have to pick on our few tomato plants?? I guess they pick out the prime food first and then go with the rest. Thank you for the reply. It’s interesting, I have read online other people who keep a batch for the entire season, but they might only be spraying flowers, bushes, etc. What I may do it spray this stuff near the plants on the ground, etc. or leave some in an open container nearby and see if the smell alone will keep away the deer and other undesirables. But Im not going to spray the fruit/vegetables! People leave bags of dried blood, etc. hanging near fruit and vegetable plants to keep away deer, so smell must be a great deterrent. They don’t have to taste it. We will see what happens! Hi, Tony! We’ve even heard that people hand Irish Spring near their plants. It is the smell but I can’t quite see hanging a bunch of soap all around our yard. The eggs are cheaper. Let me know how it goes. Have a great weekend. I think that’s a very wise idea, Tony! I’d sure had to have your berries ruined. I love hostas. I have several!!!! Thank you for linking up at #BloggingGrandmothersLinkParty. I’m sharing your post on social media. Thank you, Clearissa! I certainly appreciate you sharing the post. The deer seem to find our yard and garden a very tasty place to hang out in the middle of the night. I’m going to try your repellent. Thank you for linking up at #BloggingGrandmothersLinkParty. I’m sharing your post on social media. Thank you for sharing, Carol. We’ve tried expensive repellents but this seems to work and being consistent is important. Our property is surrounded by deer! Thanks for these great suggestions. Hi, Donna! If you have a lot of rain, reapply. Have a great weekend. Hi, Lori! It’s really helped me out and it is a cheap way to keep those hungry critters away. Good to know. Thank you Marisa for linking up at the #BloggingGrandmothersLinkParty. I shared this post. Hi, Dee! It’s really helped my hostas. I am loving the hostas! I could have used this when I lived in Ohio, I used to hang a little thing of repellant right at the top of my hostas. The deer would put their head down, smell it and move on! Thanks for finding the party and joining us at Celebrate Your Story! I’m happy to join you Chloe — I’m thankful for the invitation. Does this work on flowers, too? The deer literally dug up all my tulips this spring and have been eating my ornamental bushes as well. Can it be used on vegetables as well? Aaauugh! Hello, Leenie! Yes, it works with flowers, bushes, trees, vegetables. It is all natural — eggs and water. I believe it’s the protein in the eggs that turn off the deer. You do have to be consistent. If you get lots of rain reapply. Make sure the leaves, flowers are dry before applying. It will last after sprinkles. 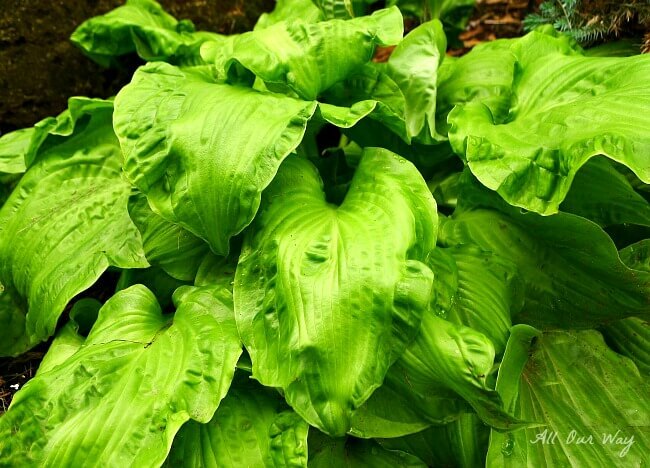 Your hostas are gorgeous, Marisa!!! Gorgeous! Thankfully, we don’t have problems with deer, but we do have rabbits who love to dine on almost everything. I’m amazed that your deer repellent is an egg and water mixture!! Really!?! 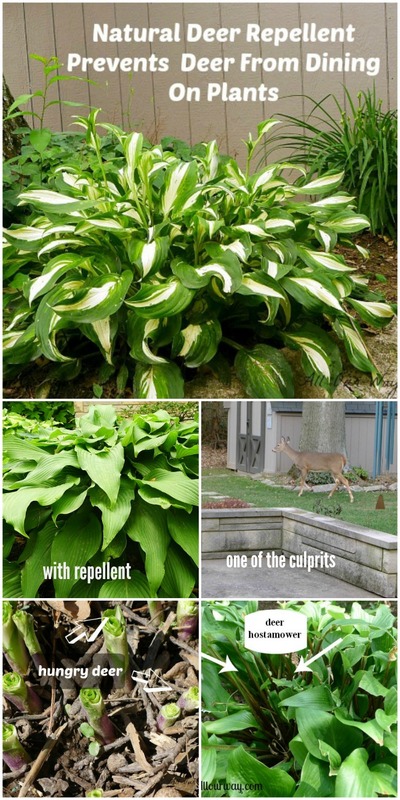 I’m going to have to give it a try, as maybe it would keep my hostas free from pests and bunny bites. So far the bunnies have left the leaves alone and as I said we have LOTS of rabbits and we live in the heart of town. 🙁 When you first put on the egg mixture it does have a smell — my hubby really dislikes it! I’m hoping that the deer and other plant predators feel the same way. Tomorrow I’ll spray again because we’ve had so much rain. I’ll keep filling everyone in on how it’s working. Your solution seems unique. We have armadillos problems here. They make hole in our lawn much like moles. Wonder if they would work here. My husband buys a solution from the home store but I don’t like to use chemicals. I wonder if a trap such as one for raccoons would work? When we lived in the country we had so many destructive raccoons we got a trap and then we could cart them 20 miles down the road. I figure armadillos come out of their burrows. I am totally unfamiliar with them but I imagine they would be just as much of a bother as all the other varmints. I agree with you and chemicals 🙁 If you find a solution let me know. Love your blog and your recipes, and this one caught my eye immediately. 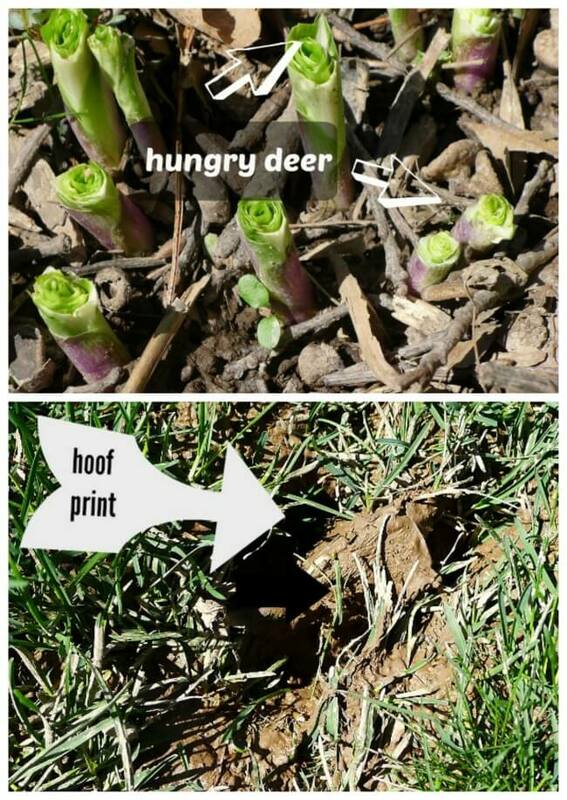 Several years ago I dug up about 100 hostas and other “deer candy” plants after getting disgusted with the deer literally taking up residence in my garden (actually sleeping there & getting up for midnight snacks!) I have used a product called Liquid Fence and it works quite well, but is expensive, smelly, and has to be reapplied quite often. My husband now has devised a system (we call it Spook Man) using motion detectors and a 10′ tall yellow inflatable “man” who jumps up and waves his arms if the deer approach. It works like a charm & my garden now is lush and wonderful. Those persistent deer, however, have discovered two small areas that are not detected and still sneak in for a few bites. I’m anxious to try your egg potion and hope that does the trick for those areas. We also do have a vole/mole problem and I’d love to hear your solution to that problem. Thank you! 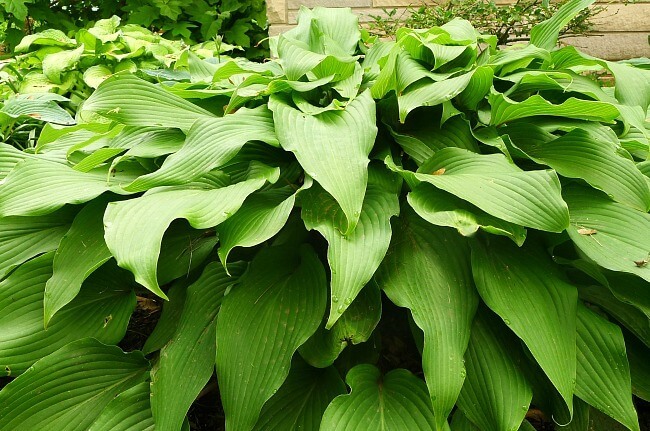 I do understand when it comes to hostas — I had quite a variety when we lived in the country but ironically we didn’t have deer problem until we moved into the city. I tried every kind of deer “preventive” that I could find on the market. I would order nice smelling solutions, stinky smelling solutions, the bar soap solution, etc. This is the one thing that I found works. We lost a few hostas to voles too. They were huge and all at once they were smaller and smaller then nothing. This year we didn’t mulch — I believe the mulch we were getting were attracting the voles. This year I haven’t seen any evidence of them. Now moles, we have a scissor style mole trap and with patience you get them every time. I hear the poison worms work but they are pretty expensive. I hope that helps. So happy you won the war! Your hostas etc…..are beautiful! Wow! Great post, Marisa. I wish I had known about this 10 years ago. We lived in a different city, and our hostas looked just like yours—-nubs—thanks to the deer. This would have been such an easy solution! So glad it’s worked so well for you!